Whitney Houston's funeral took place today in New Jersey. It was streamed live on CNN, even though I do believe most people thought that it was a private occasion and didn't know it was going to be streaming. It was long enough though that anyone who owned a television probably caught a glimpse at some point or another. If you did miss it, here were my most memorable moments from the funeral. Kevin Costner speaking. He did a good job, although I don't know why he talked so much about when he attended church when he was little, but it was funny. R Kelly sang I Look to You. The man does has a poor track record in his personal life, but there is no denying that the guy can sing. 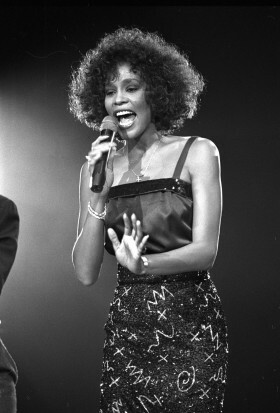 Some people questioned his performance, but it is Whitney's funeral...not yours. I think her family would know who she would and wouldn't want performing in her honor. The Reverend Tyler Perry. Who knew. Mr. Perry is a man of many talents...does he pastor a church on the side? I liked his account of Whitney though. Very nice. Alicia Keys. We all know Keys is an A+ talent, so I don't have to point out how not awesome in comparison she sounded, but that was because she was crying. These are the types of performances you expect at a funeral, from people who are devastated that you are gone. Whitney's casket being carried out to her famous song I Will Always Love You. Beautiful ending.